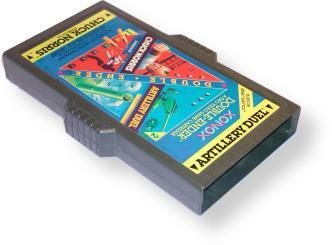 The Double-Ender is two games in one - each end of the cartridge has a different game. These cartridges are about 2.5 inches longer than a standard cartridge, and the case is wider in the middle. There is one long label that is typically blue, with game art for both sides split diagonally down the middle. Titles are printed in red text against a yellow banner. All the titles found on the Double-Enders can also be found in standard single-ended cases.